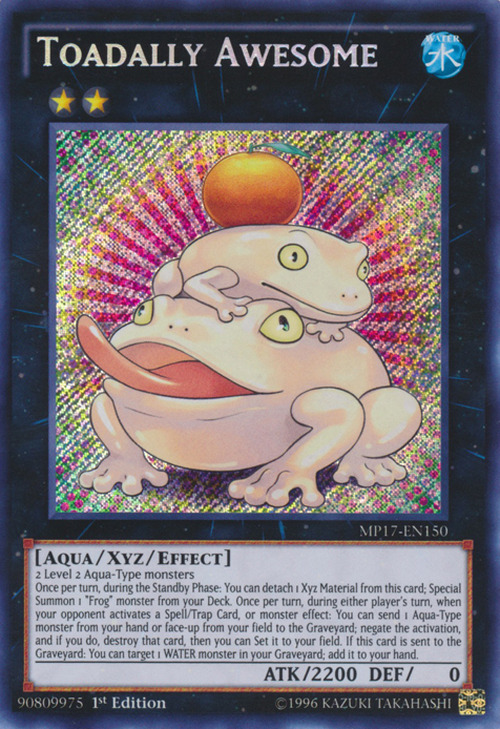 Like many other Frog or Toad monsters, this card's Japanese name is a pun. This card's name is a pun of 持ち帰る (Mochikaeru), which means to bring back or carry home. The mochi part is spelled 餅, a type of Japanese rice cake, with which Toadally Awesome shares coloration. The two frogs in this card's artwork may be a reference to not only the monster's Rank, but also its required Xyz Materials. This monster's appearance and Japanese name Mochi Kaeru are based on Kagami mochi. This card's English name is a pun on the expression totally awesome and the word Toad. This card's English name is also one of the few, if not the only name that doesn't have a noun, having only an adjective and an adverb. The resolution of "negate the activation, and if you do, destroy that card" is always applied, but the resolution of "then you can Set it to your field." is optional. Also, the resolution of "negate the activation, and if you do, destroy that card" and the resolution of "then you can Set it to your field." are not considered to be happening at the same time.